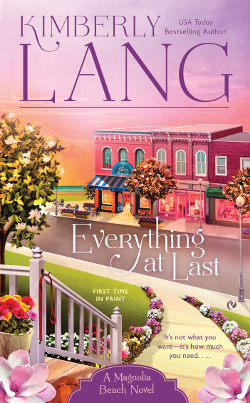 At first sight, Molly Richards knew Magnolia Beach, Alabama, was the perfect place to escape her unhappy life. And though she’s proud of the small coffee shop she’s opened, something is missing. But she won’t let herself be burned by love—again. Veterinarian Tate Harris finds the local dating scene awkward, since he’s known most of the eligible ladies his whole life. But he’s finding it hard to resist the unassuming charm of the sweet-faced owner of Latte Dah. And when a late-night pet emergency finds Tate at Molly’s house, that fascination turns into a potent mutual attraction. There was no way to politely decline, which meant the uncomfortable kitchen conversation she’d avoided was now simply going to be her uncomfortable walk home conversation instead. She scrambled to gather her thoughts. As she knew fine well, no one liked to hear “I’m not interested in you,” and dinged pride aside, she saw no reason to throw something like that in his face out of petty revenge. Tate was nice, and cute, too–tall and broad-shouldered with inky black hair and bright blue eyes. If she were shopping the market, he’d be an excellent choice. But she wasn’t, so it didn’t matter. Now she just needed to get back to the friendly acquaintance footing they’d lost tonight due to Helena’s meddling. Please just let it die a quiet, non-embarrassing death. She had no such luck, though. They were barely out of earshot of the house before Tate said, “Can I apologize now?” His voice was a mix of exasperation and teasing, and he wore a self-deprecating smile that was really kind of charming. “It’s fine. My feelings aren’t hurt.” The need to strangle Helena was coming back full-force, though. “And you’re not interested. I get it. It’s okay.” She tried to sound assuring, but Tate just shook his head. Tate pulled back a little, and she felt bad almost immediately. She hadn’t meant for the words to come out so sharp. But the surprised look that followed nearly made her laugh. He hadn’t been expecting that. He might not want to ask her out, but considering there were plenty of women in Magnolia Beach — and the surrounding counties, too — who’d be more than happy to grab him right up, her words had to have been a shock. Considering he’d been an unwilling participant in this evening’s farce, she’d give him a pass for including her in that bunch of women. But only this one time, and only because he was Helena’s friend. Plus, she reminded herself, no one liked to hear something like that. “Exactly.” It was still awkward, though, and after a few more throat clearings and random looks around, they finally started walking again. Quietly, this time, thank goodness. The breeze kicked back up, and Molly ran her hands over her bare arms to rub the chill bumps away. “You cold? Take my hoodie.” He was already shrugging out of it. “I don’t need it,” he insisted. “I only have it with me because Helena borrowed it last week and returned it to me tonight. Here.” Tate held it out, gentleman-style, ready for her to slide her arms in, and further refusal would just make her look silly. The hoodie held his body heat, chasing away the chill immediately. As she zipped it up, she could smell the spicy scent of Tate’s aftershave. She’d noticed the scent before, but from a respectable distance where it had only been a faint aroma. This time, it surrounded her, filling her nose and lungs each time she inhaled. It was nice. Unsettlingly nice, actually, and it took her a moment to figure out why. It was just so utterly, unabashedly male, and coupled with the warmth of his body and the loaning of his clothes, it pushed the right set of buttons in the right order to cause a little flutter low in her belly. Maybe if Helena hadn’t had matchmaking on her mind, therefore putting it in her mind, this wouldn’t be happening. She’d never denied Tate was a hottie—she wasn’t blind, after all—but she’d never let her thoughts wander past that to the man himself. It wasn’t that she hadn’t noticed, she just hadn’t noticed like that. But it was a lovely evening and she was on a quiet walk with a good-looking, smart and kind man who smelled nice and had the good manners to offer her his jacket. And now she seemed to be noticing him in a big way. It had been so long since she’d thought—really thought—of any man in that way, she figured her ovaries were all but dust anyway. Finding out that wasn’t the case was nearly overwhelming. Damn Helena for putting ideas in her head.